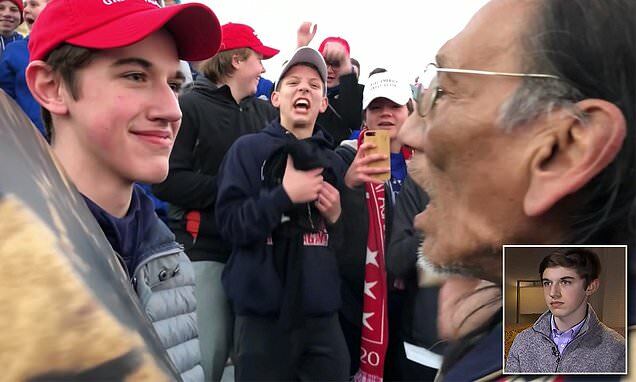 The teen from Covington, Kentucky has sued the Washington Post for defamation, claiming the newspaper falsely accused him of racist acts and instigating a confrontation with a Native American activist in a January videotaped incident at the Lincoln Memorial. The lawsuit, filed on Tuesday in U.S. District Court in Kentucky by Covington Catholic High School student Nicholas Sandmann, 16, seeks $250 million in damages, the amount that Amazon founder Jeff Bezos paid for the Post in 2013. The lawsuit claims that the newspaper 'wrongfully targeted and bullied' the teen to advance its bias against President Donald Trump because Sandmann is a white Catholic who wore a Make America Great Again souvenir cap on a school field trip to the March for Life pro-life rally in Washington, DC on January 18.